I have been having a bit of a clean out at home lately. My storage, fabric, doll supplies, ironing etc room is looking quite lovely, but still not stylish enough to show a picture of. At least I can walk around in the room and find things. I even got busy with the labelling machine so I could tell what was in all the boxes. When I was cleaning out some old books and magazines, I came across this photo of a cushion worked in a style called colour wash. According to the instructions, you choose patterned fabrics, arrange them from dark to light and then sew them all up for this effect. I love it - it reminds me of watercolour painting, which is my painting medium (when I get to paint, that is). I am not mad about patchwork, but if I was going to do it, having a go at colour wash, crazy patchwork and applique. P.s. I still have to clean out my computer, sewing machine, storage, craft supplies etc room. Yikes! You did a nice job and it looks great. 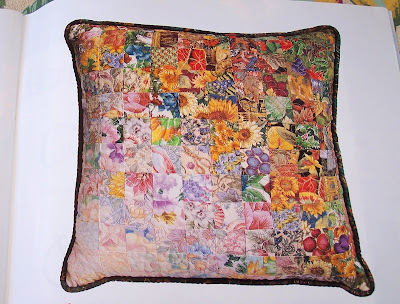 I've always liked crazy quilts and one of these days . . .